Any person logging on to or using the site ("the Visitor") has unconditionally accepted the terms and conditions of use and these constitute a binding and enforceable agreement between the visitor and the MFCSL. The information on this Website & MFCS Mobile App is presented as general information and no representation or warranty is expressly or impliedly given as to it accuracy, completeness or correctness. The visitor is presumed to have read the terms and conditions of the Website & MFCS Mobile App and is deemed to have agreed, understood and accepted unconditionally all the terms, conditions, procedure and risks of logging onto the Website & MFCS Mobile App and cannot claim, at any time, ignorance of any or all of them. All relationships of any visitor of this Website & MFCS Mobile App wheresoever's situated is governed by and in accordance with the laws and jurisdiction of Mumbai, India. This Privacy Statement explains why we collect the information and how we use personal information and comply with the requirements of the Privacy Act. If you have further questions relating to this policy please contact us on toll free no 1800-22-4008 or write to our Customer Care Officer at Mahindra First Choice Services, 1st Floor, 271 Business Park, Model Industrial Estate, Western Express Highway, Goregaon East, Mumbai – 400063 or e-mail at customercare@mahindrafcs.com. This Privacy Statement explains how we handle personal information you share with MAHINDRA FIRST CHOICE SERVICES business. We may obtain this information through MFCSL Website & MFCS Mobile App, MFCSL social media properties, vehicle-related consumer Website & MFCS Mobile Apps, events, promotional activities and through our customer call centres. 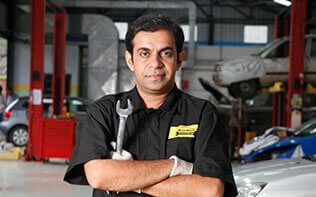 It also applies to information about you and your vehicle that MAHINDRA FIRST CHOICE SERVICES obtains from MAHINDRA FIRST CHOICE SERVICES affiliates and other sources such as companies that provide lists of potential service users. MFCSL Website & MFCS Mobile App and social media properties, events, promotional activities and through our customer call centres. Other sources such as companies that provide lists of potential service users. MFCSL collects information on individuals when they book their services, in order to process the transaction and to fulfil booking requests with service centres. MFCSL also collects general business information relating to employees, contractors, shareholders and service managers. This policy explains the main features of MFCSL use of member and customer information and does not outline in detail the use of contractor and employee information. Under the Privacy Act, there is a general exemption from the coverage of employee records. Information about you or your vehicle may be used to respond to your requests for service brochures, to customize and improve communication content, or for marketing, brand promotion or product research. It may also be used to provide you with helpful offers and information on MAHINDRA FIRST CHOICE SERVICES products and services. MFCSL may also share personal information collected with our suppliers for the exclusive purpose of providing services (for example, mailing information in response to your request for a service request or to follow up on your query or complaint or to conduct a research or feedback survey) and with our business partners to conduct joint marketing programs with MFCSL. It may also be shared in connection with the sale, transfer or financing of a significant part of a MFCSL business. MFCSL will not share information about you or your vehicle with other third parties for their independent use without your permission. Required by law or statute. To protect the rights, property or personal safety of another MFCSL member, any member of the public. When you provide your personal information to us, MFCSL will give you the choice as to whether or not you wish to receive further information about special offers, promotions, and changes to our products and services. If you indicate that you do not wish to receive these, we will not contact you further for these purposes. Please allow 28 working days for your request to be processed. Like many businesses, MFCSL uses a range of service providers to help us maximize the quality and efficiency of our services and our business operations. This means that individuals and organizations outside of MFCSL, such as mail houses, will sometimes have access to personal information held by MFCSL and may use it on behalf of MFCSL. We require our service providers to adhere to strict privacy guidelines and not to keep this information or use it for any unauthorized purposes. Some of this information is necessary as part of our communication about the MFCSL program and is sent to all members. However, if you are receiving promotional information from MFCSL and do not wish to receive this information any longer, you may remove your name from our list either by calling us on our Toll Free Number 1800-22-4008, or write to our Customer Care officer at Mahindra First Choice Services, 1st Floor, 271 Business Park, Model Industrial Estate, Western Express Highway, Goregaon East, Mumbai – 400063. or e-mail at customercare@mahindrafcs.com and asking to be removed from our mailing list. Please allow 28 working days for this request to be processed. MFCSL is committed to high standards of data security with respect to information collected on our site. We offer SSL encryption; the industry standard security measures for transactions made over the Internet. For more information about these new technologies on our Website & MFCS Mobile Apps please call us on our Toll Free Number 1800-22-4008, or write to our Customer Care Officer at Mahindra First Choice Services ltd, Mahindra First Choice Services, 1st Floor, 271 Business Park, Model Industrial Estate, Western Express Highway, Goregaon East, Mumbai – 400063 or e-mail at customercare@mahindrafcs.com. If at any time you want to know exactly what personal information we hold about you, you are welcome to access your record by writing to us at Customer Care Officer, Mahindra First Choice Services Ltd., Mahindra First Choice Services, 1st Floor, 271 Business Park, Model Industrial Estate, Western Express Highway, Goregaon East, Mumbai – 400063 or e-mail at customercare@mahindrafcs.com. Our file of your information will usually be made available to you within 14 working days. For security purposes confirmation of your identity will be required prior to supply of this information. If at any time you wish to change personal information that is inaccurate or out of date, please contact us and we will amend this record. If you wish to have your personal information deleted, please let us know in the same manner as referred to above and we will take all reasonable steps to delete it unless we need to keep it for legal or statutory reasons as mentioned in Clause 2. MFCSL endeavours to take all reasonable steps to keep secure any information which we hold about you, and to keep this information accurate and up to date. MFCSL uses a sophisticated computer data network, and all access to the computers and system devices are password controlled. Employees can only gain access to data if they are authorized, We also require our employees and data processors to respect the confidentiality of any personal information held by MFCSL. Data is secured in a secure data centre environment, We use sophisticated detection and intrusion technologies to ensure that there are no network security breaches. MFCSL controls and operates this web site from India. Unless otherwise specified on or by this web site, this web site is intended to promote only those Mahindra First Choice Services that are sold by Mahindra First Choice Services in India and its territories, and Mahindra First Choice Services makes no representation that materials in this web site or the products described thereby are appropriate or available for use in other locations. All visitors to this web site are responsible for compliance with all Indian laws applicable to them with respect to the content and operation of this web site.